The Olympic spirit is alive and well in my house. I rediscovered my winter Olympics cheer the night before the opening ceremony when ice skating legend (and guy I remember exists only once every four years) Scott Hamilton yelled his first overly exhuberant shout-out to the jump being executed. Oh Scotty, you had me at "Triple Tooooe!!"... you had me at triple toe. This particular brand of cheer can sound a lot like criticism, depending on the day, event and results. The thing is, I spend a solid 50.1% of my Olympic viewing time thinking about the wonders that make up the Olympics. It is truly amazing for these folks to be competing on this grand international level. It is inspiring and enviable that they are recognized at the top of their chosen field. I marvel at the complexity and relative strangeness of each individual sport: air-tricks and flipping/spinning with a board strapped to your legs; back sliding down an icy half tube at 90 MPH; the other one where you go head first down that icy half tube thing; cross-country skiing through the woods and stopping every so often to shoot at targets; bouncing down a snowy hill in a way that makes me think your legs must be made of some poly-synthetic plasticine material, cause there's no way human knees can or should do that. For the record, I didn't even know curling existed until I lived in the UK during a winter Olympics... insert joke about the American media only covering sports the Americans do well in here. The sports are amazing, even if many of them border on the ridiculous. Sometimes I stop to ponder the fact that winter sports are literally being made up as they go along. I am in awe... most of the time. The rest of my time is spent critiquing these wonders of the human species. Never have people with less athletic prowess been so hyper-critical of sports we haven't the first clue how to perform, much less compete in. I sit on my couch, usually with some sort of snack at the ready, and watch these people throw themselves down mountains and call them out for being "a bit wobbly," "not at all spinny enough," and "an embarrassment to their country." Ok, I don't really use that last one too often, unless we're talking about the fifth snowflake debacle from opening night. 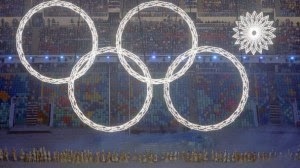 I mean really Russia, get it together. The industrial revolution reenacted with red floating machine parts and thousands of your people dancing in Bolshoi-ready choreographed unison were lovely, but for me, it was all overshadowed by that darn snowflake. Maybe if it hadn't happened in the beginning of the show? I don't know, I just couldn't get past it. It f#$%ed it up for me, and dare I say all the other a$$hole viewers like me out there. The official statement was that they weren't embarrassed. Russia, you don't have to be embarrassed, but come on, you should be a little bit. What Russia doesn't have to be embarrassed by is someone locking himself in a bathroom. I've done it myself in my own apartment, and I wouldn't say that we have an infrastructure problem. By the way, the same person got stuck in an elevator too... Maybe he just needs someone watching out for him, cause it doesn't sound like he should be left alone in any country. As for the snowboarders, I teeter between thinking they are the coolest, most laid back bunch of dudes and dudettes out there to thinking that they should really care more than they appear to. Case in point: if an ice skater or a gymnast doesn't land a jump, their heartbreak is instantly apparent, the agony ooozing from the rest of their tainted, confidence-lacking performance. I like to feel that disappointment at home. But those snowboarders miss a landing and they're like, "Oh well brah, I guess I didn't do well this time. Weeeyyyywwww. Partay!" Of course I admire their resilience, but sometimes I just wish it seemed like they actually cared more about winning and impressing me. It's actually a double burn on me and my talents. Not only do I lack the physical ability to compete in any of these elaborate sports, to top it off I lack the laissez-faire attitude to be okay with f#$%ing it all up on the big day. Those little sh!ts. I mean, those amazingly talented, fun, cool and well adjusted little sh!ts. I could probably do a better job managing my expectations and disappointment, but I don't believe I am to blame here. My expectations are solely based on the amazing things that the network promises from the young whipper-snapper they chose to do a video profile on the day before the event. As a result, my disappointment is real, often severe when they don't live up to those fresh expectations in my head. I am a product of NBC's Olympics propaganda. Come on NBC, don't build them up only to let them fall. Schadenfreude is alive and well, taking up residency in Sochi this month. Because I can, I blame Matt Lauer. Another winter Olympics, another chance to pretend like I know the rules or the subtle nuances of what the judges are looking for. Charging the section with a tucked end? Totes. Compressed on her joinery motion? That's what I was thinking. Yes, she did totally juice it out on her tail... Ok, what the F? I seriously have no idea what they're talking about, but I am swept up in the Olympic moment for now, for the next ten days (or whenever it's over), never to care about these sports again until four years from now in whatever chilly place the next one is. I'm sure they'll mention it in the lead-up starting 3 years from now. Until then, I have my time revelling and critiquing Sochi. Good times. 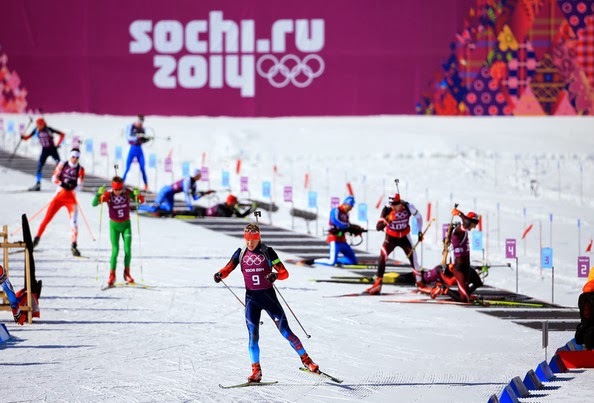 Labels: Olympic snowboarders: cool as sh!t or don't give a sh!t?, Olympic spirit, Rant, Scott Hamilton, the fifth snowflake, what the heck are these Olympic sports?